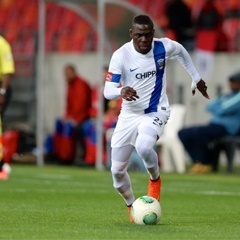 Cape Town - Troubled former Mamelodi Sundowns defender Siyabonga Zulu is reportedly training with Bidvest Wits as he looks to revive his ailing career. The talented left-back was sacked by the Brazilians at the mid-way point of the season for missing training and numerous other disciplinary issues. The 25-year-old made his name with Platinum Stars (now Cape Umoya United) as a marauding wing-back before winning a deal with Sundowns. However, he made just one league appearance before problems in his personal life eventually took a toll. Yet, it appears Wits under coach Gavin Hunt are willing to give the player a chance to save his career. According to Soccer Laduma, Zulu is training with the Clever Boys though it is unclear whether he is in the running to be offered a contract. Earlier in the campaign Thandani Ntshumayelo trained with the Students after serving his sentence for cocaine usage, however, he did not put pen to paper on a contract. Ntshumayelo has since signed for Baroka until the end of the campaign with an option for a further two years if he impresses.